The Scarpa Vapor Lace is the golden child of the Vapor family. 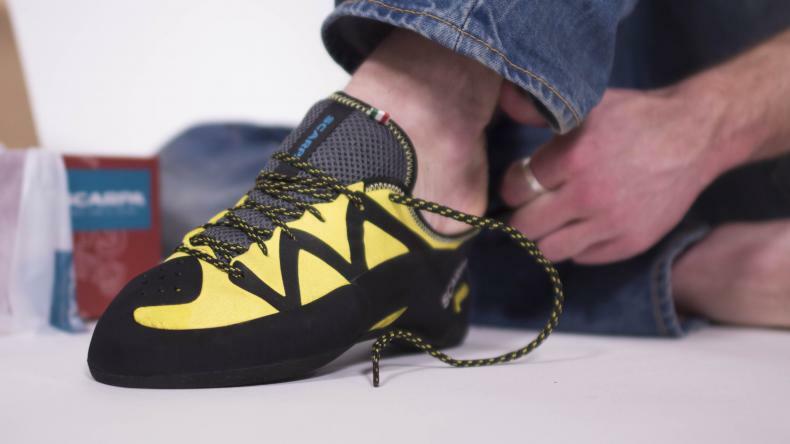 With a stiffer midsole and more customisable laced closure system, the Vapor Lace maintains the highly accredited "performance-with-comfort" fit of its older sibling but with a more supportive and stable design that will suit multipitch climbers and edging intensive climbing. The Vapor Lace is the perfect gateway into the world of high-performance shoes for the beginner, or for the intermediate seeking all-day comfort in a supportive and technical climbing shoe. To achieve a high level of comfort, the Scarpa features three key characteristics. The Bi-Tension randing system does the opposite of a standard slingshot rand: rather than painfully jam the toes forward, the rand, which connects the rubber beneath the toes to the heel, decreases the tension in the toe box, providing the same amount of precision but with reduced discomfort. The upper is suede leather with a luxuriously soft feel, and the tongue is perforated to enhance breathability. This lined suede leather will stretch up to half a size. 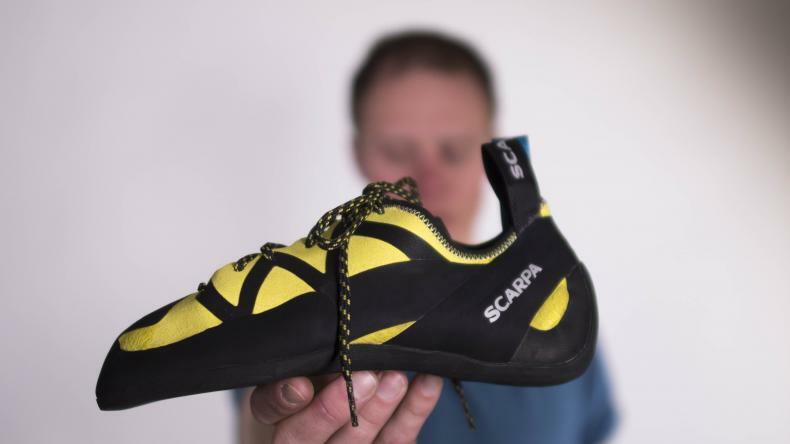 If you'd prefer a softer version that's better for bouldering and gym climbing, try the velcro version, the Vapor V.
I used to climb in the vapour V shoes from Scarpa. And i loved them. Then I bought these shoes half a size smaller, and I have climbed in them ever since. The laces allows fine tuning of the fit. And the stiffness of the midsole allows me to climb all day everyday. 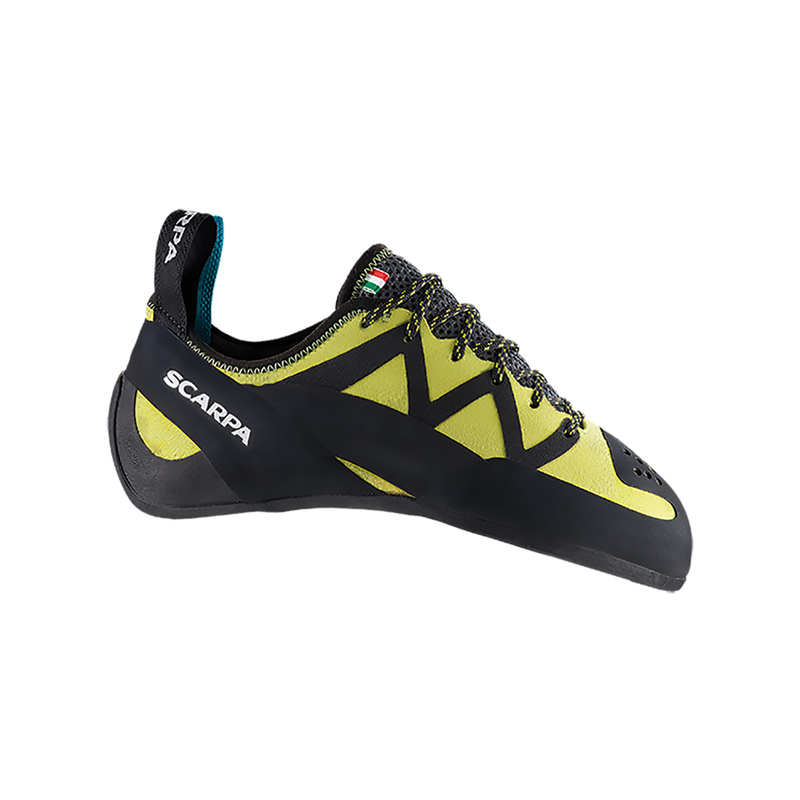 Very comfy climbing shoes but very powerfull. I use them in bouldering and in sport climbing. 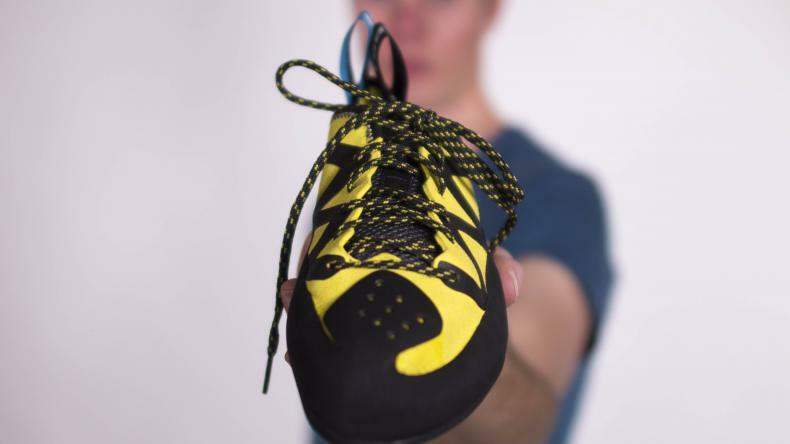 Whether you slab, crack or overhang climbing these shoes performance is solid. The shoe's outsole is constructed of Vapor Vibram XS Edge Rubber. It gives a good balance between sticky and strong. The shoes build and rubber is stiff. Compared to the vapor velcro the rubber is harder keeping a sharp edge for longer. This means the shoes can edge on small edges. It will easily stick on f6c footholds. The shoe was obviously built with heel and toe hooking in mind. Although I haven’t done many of theses moves. Rubber extends over the toe and the heel. Toe area rubber doesn’t just help grip in these areas but protects your toes. When crack climbing toes are jammed into cracks. They can get sore and the shoe can often get worn through. The rubber on the toe will protect them. The shoes performance at smearing is pretty good although it must be remembered that the rubber favors edging as it is harder. Performance on gentle overhangs is also good. Slight down turning and sharp edges aid this. The shoes can hook holds and grip easily. Although the shoes look aggressive they’re extremely comfortable. The construction of the shoe with microsuede and Scarpa’s rand design minimises potential foot pain. The shoe has pinpoint precision without any toe pain. They can easily handle 6C slab foot holds. I have heard they have no problem with higher grades. For people with odd shaped feet this shoe is perfect. The laces fit snug to your foot a characteristic velcro will never be able to rival. It should be remembered that the shoes don’t stretch much though so if they don’t fit try the size bigger. Now onto the negatives. When you step onto a climb you might get a bit of a shoe fart. Trapped air in the heel area is pushed out making a wierd sound. But I don’t really care. The shoes are harder to get off compared to velcro alternatives. The laces take longer to do up and take off. However I think the benefit of a tight fit outweighs the time wasted. Here's my conclusion. The shoes are the closest thing you're going to find to a jack of all trades. They perform well on most types of rock and angles. And they keep your foot snug and pain free. This comfy little devil feels like a slip-on with laces. Smooth as a mule on the foot. The flexibility makes it great for smearing, and the rubber sticks well on smaller holds, and the toe box rubber is enough to facilitate for a sneaky little toe hook when you need to impress someone at the crag. I thought I'd only use these for the day out multi-pitching, but I'll dance around in these at the local climbing gym as well. I consider the Vapor Lace my go to shoe for multi pitches and rock climbing up to vertical. It has a nice medium stiff sole and a very relaxed fit that you can tailor to your foot without too much pain. While this is a flat shoe, it has a little bulge under your big toe, making it easier to pull onto holds with your toe. This is a feature I missed with most flat lasted shoes. The 3.5mm XS edge sole is durable yet has very much feel for the rock. I was surprised how much feel for what you are standing one can have with such a shoe. A super nice feature is the seamless microfiber upper that doesn’t stretch much (maximum ¼ size), so buy those shoes in the size you want to wear them through all their life. I would recommend them for all people looking for a high performance lace up shoe for multi pitches and up to vertical sport climbing.